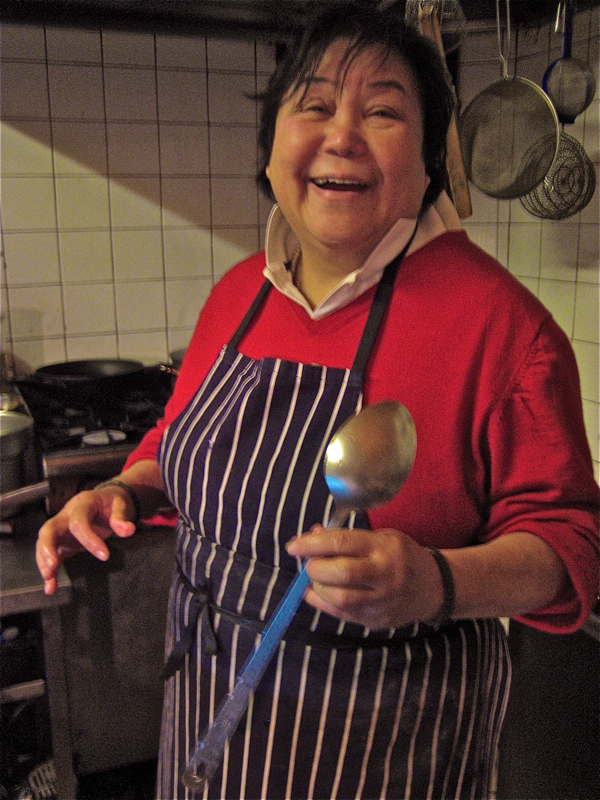 By the time you read this, Irene Sagar – proprietor of Lennies Snack Bar in Calvert Avenue in Shoreditch – will be in Thailand, gone to visit her family for Christmas. 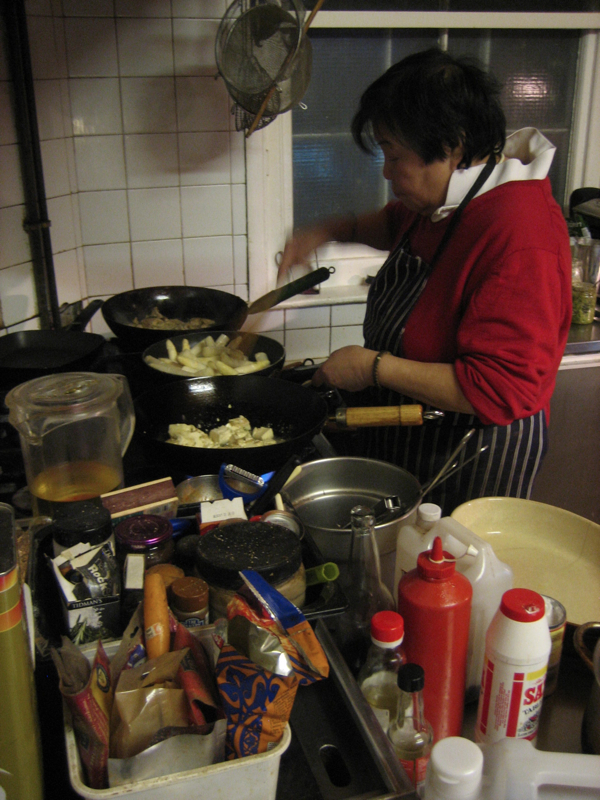 But each year, on the night before her departure, she closes early and cooks an elaborate feast for her friends. If you passed by that evening you would have seen a long table in the window with happy diners in party hats enjoying Mama’s Irene’s spicy cuisine, and it was my delight to be there amongst them to savour this special meal and record the preparations. Lennies Snack Bar presents a modest face to the street, yet the view from inside across to George Dance’s magnificent church of St Leonards opposite, framed in Spring by the almond trees in blossom, creates a breathtaking prospect. But as the dusk fell on this particular afternoon in late December, the church receded into the gloom and the lights were out in the front of the cafe while Mama Irene worked peacefully in the kitchen at the back, where I kept her company and she told me her story. “I only cook what I love, and I believe you can only do what you love. That’s why it’s not a job, it’s a passion.” she announced, stating her personal creed, as she placed a side of pork in the oven with a pat of affection and set about filleting six seabream conscientiously. “I will never get tired of cooking,” she continued brightly, raising her head momentarily to share a grin with me. 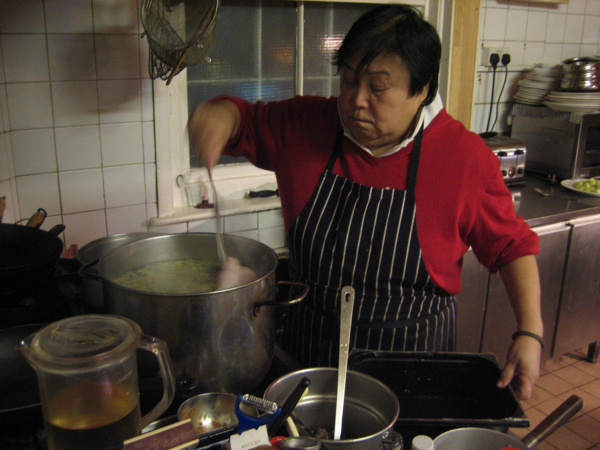 Although you might assume that Mama Irene grew up cooking the Thai and Malaysian food for which she is famous, she only came to it later in life. Born in Malacca to a Malaysian father and a Thai mother she came to Yorkshire in 1958 as the wife of an airforce officer. “It was bloody cold,” she recalled. This was where Mama Irene attempted the Cornish pasty that became her notorious culinary debut, a gesture of reconciliation for her long-suffering husband after she was arrested several times for protesting against nuclear missiles. “I told him, ‘I believe in protest,’” she confided,“‘I married you, not the airforce,’ – but he was worried that they would take away his stripe.” Mama Irene delivered the pasty to her husband at work, with such overzealous contrition that she dropped it on the floor. And, partly as a consequence of this incident, today she is divorced with a fifty-year-old daughter and no hard feelings. Halting from chopping celery and peering out towards the street to contemplate the changing neighbourhood, “I don’t know if it has changed for the better or the worse,” she said. “When I came here there was a strong community atmosphere, everyone looked out for each other. There was this button and buckle factory that stood empty for years, inhabited by Italian squatters, they had no money and no place to stay, and I used to go to wild parties there. They came to London to study circus and on Summer evenings there used to be juggling, fire-eating and rollerskating in the middle of Calvert Avenue. But also in those days, it was risky to walk down this road alone, quite often people would be attacked for their mobile phones, and they always came in here as a safe house where they could call and wait for the police to come. This was the only cafe here, and I stayed open late so students studying art and photography at Hackney College could come and eat. 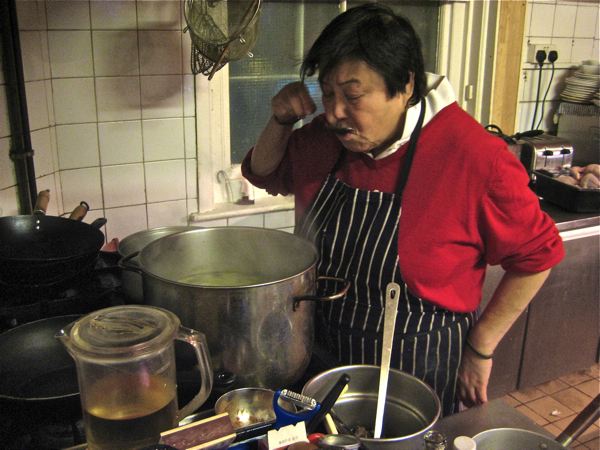 They used to say, ‘Let’s go to Mama Irene’s and get a bowl of soup’ and they all gave me a couple of pounds each and I made them a bowl of soup, that’s how opening in the evenings first came about.” Since then, Mama Irene has been running her cafe by day and opening as a Thai restaurant at night, building up a loyal following and acquiring a lot of friends. There is nothing swanky about Lennies Snack Bar, simply a plain cafe with an open kitchen serving honest food and that is just how I like it. 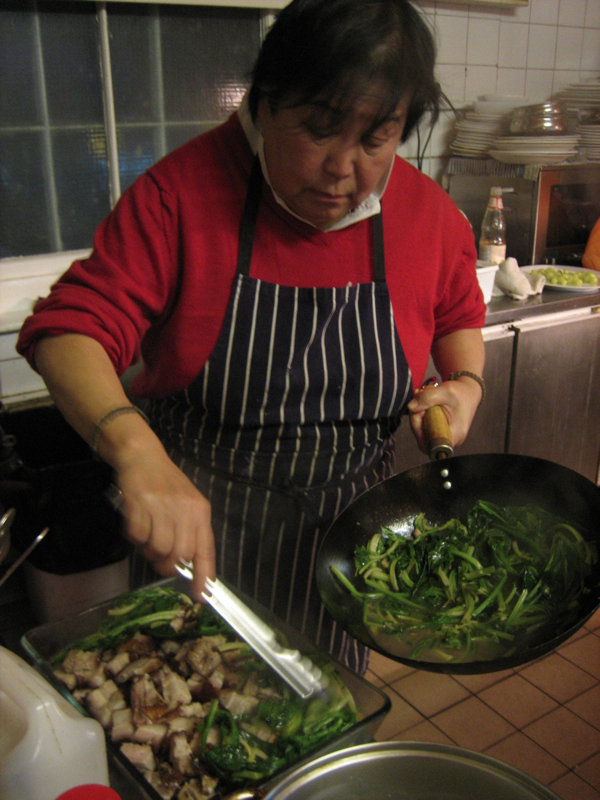 By now, guests had begun to arrive, taking refuge from the cold night and sitting around in hungry anticipation, watching appreciatively as Mama Irene had three woks on the flame simultaneously, cooking the tofu, greens, and asparagus. With a placid nature and concentrated application, she had prepared an entire menu of dishes as we talked, and now they were all ready to be served at the same joyous moment. We had come to pay tribute to Mama Irene, and as we took our seats around the table, we were her children and we were blessed with her beneficence. 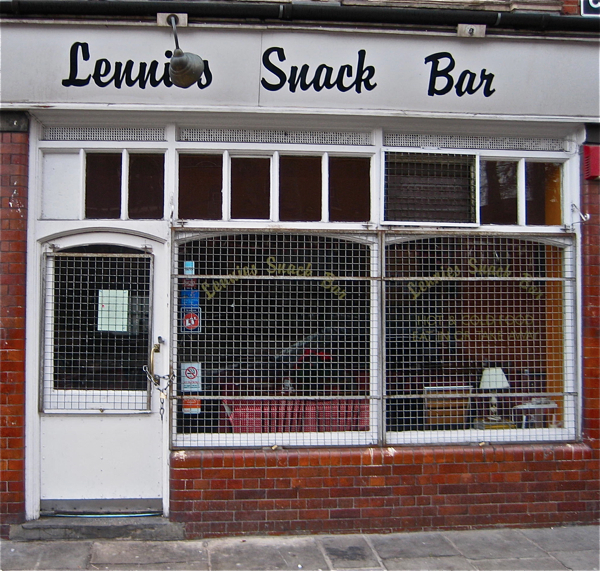 Lennies Snack Bar, 4 Calvert Avenue, is closed until Tuesday 4th January while Irene is in Thailand. 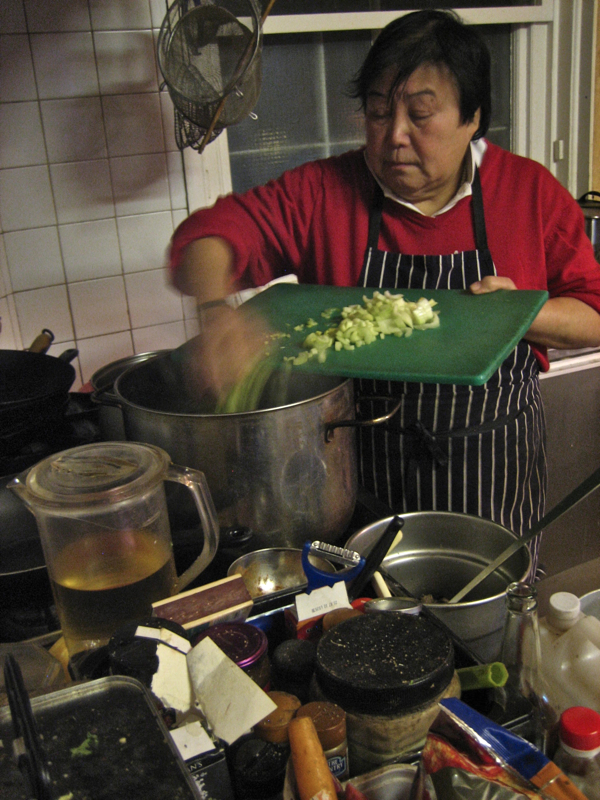 Thanks for this post about a fascinating woman and a wonderful eatery for the fortunate locals. The contrast of the snowy Yuletide streetscapes makes the coziness of this special place seem even more inviting.